It’s that time of year again. Christmas is over. The presents have been exchanged, unwrapped, played with. Now, it’s just a waiting game until the New Year begins, full of hope and promise. Lord help us, let 2017 be filled with hope and promise. For me, 2016 was very much a transition year. Many necessary life changes (some wonderful, some devastating, some just plain overwhelming) have left me exhausted but strangely ready to start anew. So, for the first time in a long time, I have made resolutions. I gave up on New Year’s resolutions years ago. After years of the same thing (lose weight, eat better, get organized, start exercising regularly) yielding the same result (maybe losing weight but that was about it), I gave up. Clearly, I would either do it or I wouldn’t. I needed to find a better motivator. And I have. She’s 6. So, this year, now that the transition year from hell is over, I figured Jan. 1 was as good a day as any to start leading a healthier lifestyle. And that’s where I’m leaving it. Be healthier. Use that concept when making life choices, from as simple as what to make for dinner to as all-encompassing as who I allow into my life. This spills into the work front, too. Running a company of this size is a big job. And managing talented and complicated authors is sometimes an even bigger job (think herding cats). For a Type A overachiever like me, that can lead to a work/life imbalance. Big time. But being a single mom means that can’t happen. And frankly, a healthy home life allows for more energy and focus to create a healthy work life, so really, that “balance” so-to-speak is essential. So, as I work toward a healthier home life and work life, it’s energizing me to try all sorts of new things, including new ways of creating, selling and promoting our books. To that end, I’m conducting an experiment, and you, dear readers, are my Guinea pigs. I’ve created an ebook using an ebook creation program called Vellum and uploaded it as a one-week-only giveaway through a service called BookFunnel. 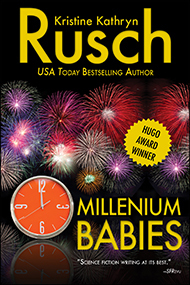 So, please, download your free copy of Hugo Award winning “Millennium Babies” by Kristine Kathryn Rusch by clicking here. It will be available until Jan. 2, 2017. And now you can try something new for the New Year, too.